Several communities of koalas in the Mumbulla State Forest and the Murrah State Forest on the NSW South Coast near Bermagui are at risk of regional extinction due to plans by Forestry NSW to commence logging their forest habitat at the start of March 2010. Murrah Forestry Map: Red shaded area to be clear felled. And the bastards are to truck majestic Australian Spotted Gums to the Japanese mill at Twofold Bay at Eden for lousy woodchips again to export to Japan so they can profit from paper. What mugs are Forests NSW and the NSW Keneally Government? Surveys by the NSW Department of Environment etc. have found evidence of a recovering population of around 50 koalas in the Mumbulla State Forest, south of Bermagui. 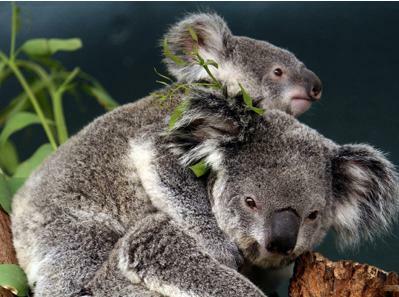 A study done by the National Parks and Wildlife Service (NPWS) confirms there is a small but viable koala colony in the Mumbulla and Murrah state forests, which lie between Bermagui and Bega. In this 2010 International Year of Biodiversity Forests NSW are set to destroy one of Australia’s critical koala habitats. On the south coast of New South Wales, the area south of Bermagui known as the Murrah/Mumbulla area, has recently been confirmed as critical habitat for the very last known koala population on the Far South Coast. The koala population has been decimated by habitat destruction on private and public lands and, over the past decade, extensive forest dieback. Volunteer conservationists say they will confront loggers head-on in an effort to save the habitat of a small colony of koalas on the far south coast of New South Wales. Forests NSW's logging is due to start as early as Monday 1st March 2010, conservationists say. They met with Environment Minister Frank Sartor on Friday [26-Feb-2010] to discuss the issue of logging in the state's southeast forests. "The minister is deeply concerned at the situation, but seems embattled on many fronts with forest issues," Jane Salmon of the South East Regional Conservation Alliance (SERCA) said on Saturday. Ms Salmon added. "Members of the south coast are sick to death of 40 years of woodchipping and associated environmental destruction," she said. "We are determined to save the far south coast koalas." "State Forests (Forests NSW) will not rule out the start of logging in the key koala areas as early as next Monday," she said. The decision to log these forests indicates that negotiations between the NSW Department of Environment etc and the State Government agency responsible for logging, Forests NSW, have reached a compromise and the koalas and their habitat are the losers. Residents and local conservation groups are calling on the State and Federal Governments to save the koala population from destruction, and to save the health of the estuary and the oyster industry, in addition to retaining the vast carbon sequestration potential of the forests and retaining the tourism economic potential of the area. "The significant social and economic costs of reduced biodiversity can only increase while our natural systems are poorly managed,” said Pru Acton, spokesperson for the South East Region Conservation Alliance. "Credible experts agree that the cost of logging this habitat is not only the last few koalas, but also potable water supplies, oysters, the inspiration for the local artists community, and another chunk of the Wilderness Coast's tourism potential." Conservationists state the native forest logging industry is unsustainable and only propped up by political will, public subsidies and union backing. "It seems the NSW Government has now decided its contractual obligations to supply sawlogs locally and woodchips to Asia is more important then protecting this much loved native animal", said Pru Acton. Residents and local conservation groups are calling on State and Federal Governments to to stop any proposed logging and follow the expert advice to implement a scientifically based and data-driven management system for koalas at a catchment scale. They have called on the Federal Minister for the Environment, Peter Garrett, to step in and exercise the Commonwealth responsibilities for forests. "We call on the State and Federal Governments to add the area to the National Reserve System and reunite the lands of the Yuin traditional owners through linking Mimosa Rocks National Park with Biamanga National Park", said Ms Acton. As a result of arrests and charges against concerned residents in 2005, the NSW Government implemented a survey to establish how many koalas remained in the coastal forests between Dignams Creek and Wapengo. Although the survey was conducted across all land tenures, the few details released suggest only 15% of available habitat is occupied and koala numbers are now very low. John Hibberd from the ACT Conservation Council says if NSW Environment Minister Frank Sartor lets the logging go ahead, the koala population will be wiped out. "I think it's absolutely staggering that we're still having this debate", he said. "The south coast is marked by fantastic beaches, beautiful forests and yet we're prepared to log the forests and destroy an iconic species like koalas for the sake of supporting a foreign-owned industry that's heavily subsidised by the NSW taxpayer." Noel Plumb from conservation group Chip Busters states "the community is not going to allow this koala population to become extinct because you've got an arrogant state forest agency that won't listen to anybody." The crisis surrounding the possible extinction of koalas in the South East Forests deepened yesterday, as conservation groups met with the NSW Environment Minister, Frank Sartor. "The Minister is deeply concerned at the situation but seems embattled on many fronts with forest issues," said spokespersons for the South East Regional Conservation Alliance (SERCA). "State Forests will not rule out the start of logging in the key koala areas as early as next Monday but are also effectively blocking negotiations (to protect the koalas) with the Department of Environment, Climate Change and Water (DECCW) and the National Parks and Wildlife Service (NPWS)." "It was apparent to us in the discussions with the Minister and his senior officers yesterday that State Forests has refused to supply the critical, specific timber-supply figures that would enable Minister Sartor to negotiate for alternative supply arrangements with the Minister for Forests." "The Minister repeatedly expressed his concern that alternative supply arrangements had to be put in place because of contractual commitments to the logging industry". Concerned environment groups say "Such figures are, according to their own logic, critical if the koalas are really to be protected from the intensive logging and wood-chipping operations now proposed by State Forests in the koala area." "State Forests has also broken its public commitment, made at a community meeting in Bermagui in 2007* that there would be genuine community consultation about the future of these forests once the NPWS koala survey was released by DECCW." The completed Report was finally released by DECCW only on 23 February 2010 but without the maps critical for clear community information. The survey covers approximately 10,000 hectares of the Mumbullah and Murrah State Forests which lie between Bermagui and Bega. "This survey does however confirm south coast conservationists and community groups statements of the past 10 years, that there is a small but potentially viable population of koalas barely hanging on in the south east forests." Noel Plumb, John Hibberd and Prue Acton "expressed the deep concern of their respective organisations to the Minister that, given State Forests' present attitude, there would inevitably be direct conflict in the these forests if State Forests attempted to start logging operations. Members of the south coast communities are sick to death of 40 years of woodchipping and associated environmental destruction, we are determined to save the Far South Coast koalas." Former fashion designer Prue Acton, who is campaigning to save a koala colony from logging in a south-east forest, has discovered a bugging device in her phone. The MP3 device was found accidentally when a delivery of water was made to their property. She said it would not stop her from battling Forests NSW over logging in the Mumbulla and Murrah state forests near Bermagui. Such is the power of the logging mafia. Forests N.S.W. intends to log these forests (probably for firewood) irrespective of the findings of a preliminary DECCW report, possibly as early as MONDAY (today). This will almost certainly spell the end for these koalas, which are nearly extinct on the south coast. My facts have been sourced locally, yet I am receptive to the need to verify facts. 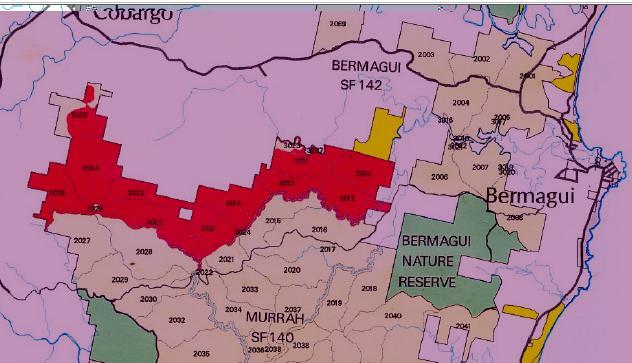 Hi Tigerquoll, Yes I am associated with friends of the five forests and sorry further down the resources page is a list of JPEP maps that shows areas to be logged etc. The current map you have shows areas of Biamanga NP that are currently, touch wood, not proposed for logging. I missed your reply and only found it by chance by scanning blog archives. Yet I appreciate your response. But you will likely not receive my reply because this blog does not link to you. So I shall go through my local contacts to try to get back to you. I am happy to replace this map with a Biamanga NP map or another as you suggest, so please send me that.